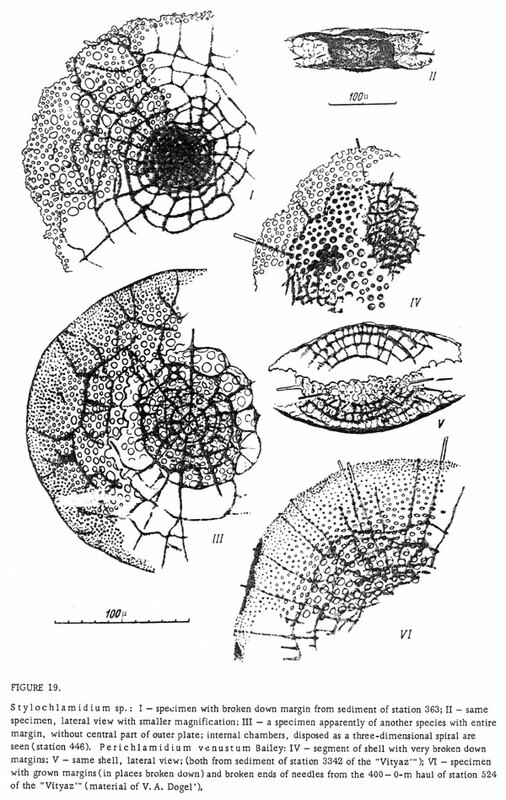 I - specimen with broken down margin from sediment of station 363; II - same specimen, lateral view with smaller magnification; III - a specimen apparently of another species with entire margin, without central part of outer plate; internal chambers, disposed as a three dimensional spiral are seen (station 446). IV - segment of shell with very broken down margins; V - same shell, lateral view; (both from sediment of station 3342 of the "Vityaz"'); VI - specimen with grown margins (in places broken down) and broken ends of needles from the 400 - 0 m haul of station 524 of the "Vityaz"' (material of V.A. Dogel).